The log of the Snark / Charmian Kittredge London. - New York : The Macmillan company, 1915. - IX-487 p.- pl. ; 19 cm. And here it is, my journal — the one accurate, continuous story of the adventures of the Snark, from San Francisco Bay to the Cannibal Isles. Sensible à l'attrait de l'aventure, Charmian London partage l'attente de Jack à l'approche de Nuku Hiva et à la perspective de se rendre sur les pas de Melville dans la vallée de Typee — « the spelling of Typee should rightly be Taipi ; but Typee it will always remain for the wander-luster » (p. 121) ; mais, une fois sur place, elle ne cache pas sa désillusion en découvrant êtres et lieux comme frappés d'une malédiction : « Where are the beautiful women and the splendid men who loved so sweetly in their happy land ? » (p. 122). 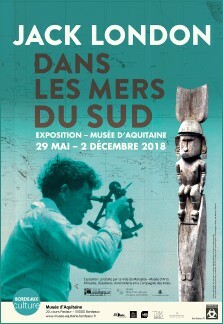 L'édition britannique du journal de Charmian, parue la même année que l'édition américaine, portait un titre aujourd'hui oublié mais plus explicite : Voyaging in wild seas, or a woman among the head hunters : a narrative of the voyage of the Snark in the years 1907-1909 (Mills & Boon). Tout laisse penser que ce raccourci saisissant n'était en rien exagéré. 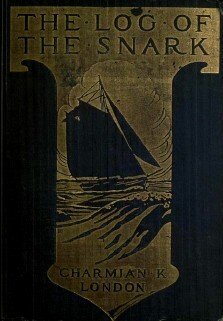 Dans ses différents récits, Jack London ne dissimule pas les qualités de sa femme, the maid of the Snark. Can't you see it ? — can't you see it, Cape Martin right ahead there in the west, and Comptroller Bay, into which the Valley of Typee opens, where Melville escaped from the cannibals. Then another and dimmer headland, beyond which is Taiohae, where we shall anchor at sunset if the fair winds holds. Captain Warren picked up Ua-Huka (Washington Island) at daylight, and the first I heard, awakening under the life-boat, was Hermann up the mainmast calling down. But so sure was I of my full stocking, and so very sleepy, that after rising half-way and seeing nothing, I subsided for another nap. I had been up at a little past three, looking at the Southern Cross — the first time below the Line. When I did finally turn out, I saw a volcanic island of beautiful form and proportion, grey-green and shimmering in the morning radiance.